Tesco seem to have some great deals on kitchen appliances at the moment. Enjoy your favourite foods the healthy way with this Breville Halo+ DuraCeramic Fryer. Using just half a spoon of oil for 1Kg fresh chips, and no oil for frozen foods, you can fry, bake, sauté and roast a host of delicious foods. The unique DuraCeramic coating transfers heat better than a standard non-stick surface - producing faster cooking times. This natural ceramic coating is 4 times more durable than standard non-stick, is scratch-resistant and won't flake or peel. It's also easier to clean due to its naturally non-stick properties, and it's free from PTFE & PFOA chemicals too, for peace of mind. The Halo's halogen element means heat-up is immediate, while the unique tilt action and rotating bowl, mean chips, wedges and roast vegetables are continuously turned throughout cooking to ensure perfectly even browning. Delicate foods like fish, mushrooms and even desserts can be cooked in the level position. The grill-only function is ideal for bacon, chicken fillets, burgers and more. How does this compare with the Tefal actifry? both airfryers? any advice please. How does this compare with the Tefal actifry? both airfryers? 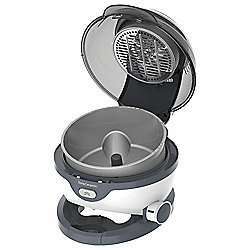 any advice …How does this compare with the Tefal actifry? both airfryers? any advice please. I prefer the arrangement and look of the Halo but there isn't a massive difference to be fair. The Halo does seem to be a bit gentler with homemade chips, especially when you're cooking a larger portion - the Tefal can mush them a bit. I would advise reading some Amazon reviews for both the Halo and Actifry and then deciding. Yup, although if you're looking for one they do keep bouncing down to £89 for 24 hours every few days. This was 69 at Amazon 2 days back, if I remember correctly. ..missed it too.